Jake arrives at the precinct with a motorcylce helmet, explaining he had to ride to work on Rosa's motorcycle because his car's in the shop. When Jake finds Captain Holt at his desk, the Captain tells him an Internal Affairs agent has taken over his office in search of a mole in the precinct. Jake doesn't think any of his fellow squad mates would be leaking information as he knows them all so well. Jake goes to Captain Holt in the break room to say he's about to speak with Internal Affairs. After Jake speaks to the germ phobic IA agent, he worriedly goes to Amy for help collecting old case files he carelessly took home and never returned. As Amy and Jake are about to leave, Madeline Wuntch arrives to gloat about Holt's precinct being under investigation. Feeling under pressure, Captain Holt goes to Rosa and Terry hoping for good news on their giggle pig drug task force. They say they have made a few arrests but no sizable progress. They are now going undercover at a silent disco where giggle pig might be in supply. After Jake loads case files into the boot of her car, he asks her to stop by his old apartment, now Gina's place, to pick up more files. When Amy phones Gina from the car, it goes to voicemail, but Jake thinks they should go over anyway. When they get to Gina's apartment, they can hear music playing inside. After Gina doesn't answer the door, Jake uses his old key to get into the apartment, where he and Amy are disturbed to find Gina and Boyle being intimate. Gina and Charles explain they got together once over the summer and then started seeing each other again a month ago. Jake is upset that Boyle didn't tell him about the relationship and has been lying to him about his activities for a month. Terry and Rosa are undercover at the silent disco. Terry is manning the bar, while Rosa works the dance floor. When a woman who claims not to do drugs or drink talks to Terry, he notices she's wearing a t-shirt from the pre-school his kids go to. Terry is proud that the sensible woman is an alumni and thinks his kids are on the right path. Outside the precinct as Jake unloads the case files from Amy's car, he's still worked up about their discovery of Gina and Charles's secret. At a bar, Hitchcock and Scully sit down with Captain Holt for a drink. When Scully asks if every thing's okay, Holt goes into an epic monologue about the problems facing him and his precinct. Meanwhile, Gina and Charles work to do damage control after word of their relationship got out. Gina wants to stop seeing Charles and find a way to stop the news spreading. Back at the precinct, as Jake tries to put the files back in the storage room, the Internal Affairs agent sees him. When Jake goes to Captain Holt's house in the middle of the night, he explains how he's now the lead suspect in the mole inquiry after being caught returning files. When Jake mentions he's no longer sure he knows everybody well after discovering truly horrible things tonight, Captain Holt instantly works out that Gina and Charles are sleeping together. Back at the silent disco, after a raver points out the aforementioned woman as his giggle pig supplier, Terry and Rosa interrogate her back at the precinct. Sergeant Jeffords seems more interested in how the pupil of a good pre-school ended up in the drug trade than uncovering her supplier. Captain Holt and Jake work through the night to uncover the mole in the precinct. Elsewhere, Gina goes to a bar after receiving a text from Gina. Gina is sad to have broken things off with Boyle. Meanwhile, a sleep deprived Captain Holt accuses Jake of being the mole. Jake then accuses the Captain of being the mole, leading him to suspend Jake and throw him out of his house. The next day at the precinct, Jake approaches Captain Holt with a new theory. Jake thinks the Internal Affairs man is actually working for Madeline Wuntch. He thinks there is no mole, it was just an excuse to get someone close to the precinct to keep tabs on Holt. Captain Holt tells Jake how he noticed Wuntch didn't tried to shake the IA agent's hands, suggesting she already knew about his germ phobia. Later, Jake approaches the IA investigator in a car park, telling him he'd hand over information on Holt in exchange for clearing his name. Jake hands the agent a flash drive. In the bullpen, Amy goes over to talk to Gina, telling her she shouldn't feel embarrassed about her relationship with Charles. Amy tells her it was shocking at first but then it seemed normal. At a cafe, as Wuntch and the IA agent watch Jake's video, Captain Holt appears on screen and tells them to turn around. Jake and the Captain then appear in front of them in the cafe. When Captain Holt accuses Madeline of a flagrant ethics violation, she admits he's right but says it would be her word against his in proving it. 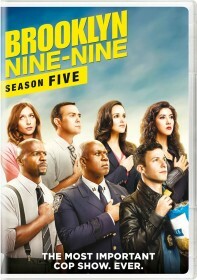 After Jake reveals that the flash drive contains a recording device, Captain Holt tells Wuntch to leave his precinct and the task force alone. Terry apologizes to Rosa for letting his personal problems affect his work. After contacting the preschool, Terry got the woman's real name and pulled her phone logs. He thinks they now have good potential leads on her supplier. Gina calls for the whole precinct's attention and publicly admits she and Charles have been sleeping together. After the other squad members have questions, Charles asks whether Gina has any regrets. Gina says she doesn't.